Home Champions Manchester City Manchester City go top of the Premier League with win at Everton. Manchester City go top of the Premier League with win at Everton. 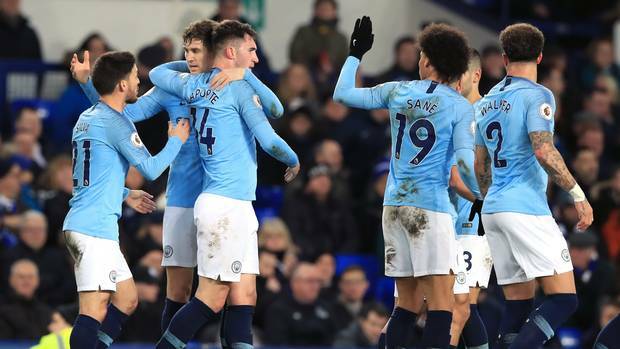 Champions Manchester City went top of the Premier League with a disciplined 2-0 win over Everton at Goodison Park on Wednesday that saw them leapfrog Liverpool on goal difference. We have played one more game than Liverpool, it’s good to be top but Liverpool has a game at Old Trafford, he added, referring to Liverpool’s match at Manchester United on Feb. 24. Everton manager Marco Silva left two of his main creative players, Gylfi Sigurdsson and Richarlison, on the bench and opted for three central midfielders a tactic that worked well as his side closed down City and limited their control of possession. David Silva curled in a free kick from the left and Laporte was somehow left unattended to head home from close-range. The goal was the 17th conceded by Everton from a set-piece in all competitions this season — prompting further questions about Silva’s insistence on zonal marking.